After classes this morning David and I wandered around Oxford until dinner time. Kelsey's feet hurt from the day before so sadly she stayed in so she could feel better! David and I started our walk by heading to the Boldein Library, for we were hoping to find where some scenes in Harry Potter were filmed. Then we walked to the gardens behind Christ Church because we had only explored them a little bit before. In the gardens we were able to walk a path that followed the River Thames for a good distance. There were many cute bridges and trees. While following the river we reached and an area where the row team practices when they are in session. There was an adorable house right on the river and connected to an old bridge (I will include a picture because it was so darling). After our walk through the gardens along the river, we ended up finding a shop called, Alice's Shop. It has a lot of Alice in Wonderland gifts for people to purchase. 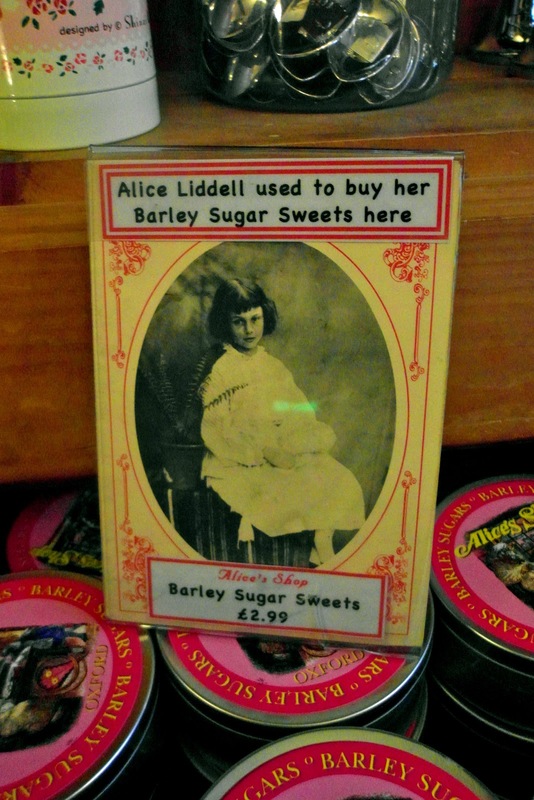 It was pretty cool because it was once the shop where Alice Liddell used to go to buy Barley Sugar Sweets! She was the girl who Lewis Carrol named his book after! After that, David and I got some coffee to warm up (because it was about 34 degrees during our long walk). That was a nice treat! Then we went to a store called Boots (their version of Target) to get Kelsey some stuff she needed since her feet hurt, so hopefully she starts feeling better! 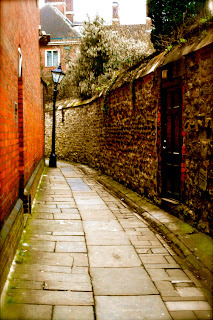 But after we got her stuff we were meandering through the city on our way home and we found this cool road that had old brick walls on either side, it was probably 600meters long and was kinda fun to walk through! We are pretty tired from all our walking to day and just plan on having a lazy evening and doing laundry (which is extra exspensive-of course).